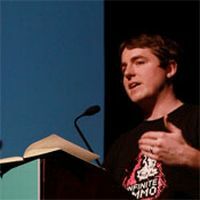 In addition to these lectures, GDC Vault's free videos section includes GDC 2010 lectures from Zynga, Ernest Adams, and NCsoft, plus highly rated lectures featuring 2D Boy's Ron Carmel and Bungie's Brian Sharp, as well as a number of other top talks. The free recordings available are a fraction of the content currently being flowed into the GDC Vault, which has added several new features with this latest content upgrade. It's now easier to navigate through the Free section of the site, with video, audio and slides more obviously split up while browsing and searching. In addition, site searches will bring up both free content and Vault Subscriber-only content in the same results page. Full GDC Vault access, including synchronized video recordings for over 200 of GDC 2010's sessions and hundreds of historical video and audio recordings, is available to GDC 2010 All-Access Pass holders, as well as All-Access Pass holders for other GDC events during the year.